The Baja California Welterweight Championship is a state title, regulated by Baja California. It is currently in Mexicali. All wrestlers in the welterweight class are eligible for the championship, and the title may only be defended in Baja California. for some reason the current title plaque is mispelled as "Walter" instead of welter. 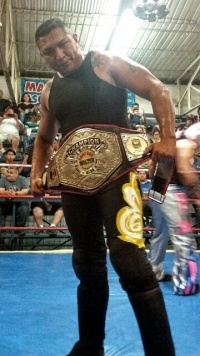 Genio Del Aire is the current champion he defeated Iron Boy, Black Boy & Super Calo Jr. On May 20, 2017 at Arena Coliseo Mexicali. ↑ Mask and Championship vs Mask and Championship match: Rey Cobra wagered his mask and the Baja California Welterweight Championship against Nitrox's mask and the Costa del Pacífico Supreme Championship. This page was last edited on 1 September 2018, at 13:00.